The Best Conference Paper Prize is the highest distinction awarded for an academic paper presented during the EFA 2017 Annual Meeting. The Best Doctoral Student Conference Paper Prize is presented for the best paper on the EFA 2017 conference program written by a doctoral student. The Pagano and Zechner Prize will be awarded at the EFA 2017 conference to the best non-investments paper published in the journal of the European Finance Association, the Review of Finance. The prize-winning paper is selected by the Editorial Board of the journal. The inaugural Review of Finance Distinguished Referee Awards will be presented at the EFA 2017 Annual Meeting to three scholars who have provided outstanding refereeing service to the Review of Finance, as voted by the Editors of the journal. The best paper presented at the 2017 EFA Doctoral Tutorial will be recognized with the Nasdaq and CQA Doctoral Tutorial Paper Prizes. 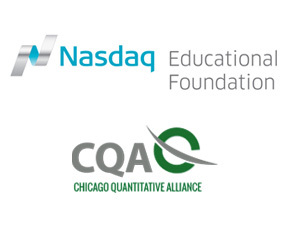 The money prize is sponsored by the Nasdaq Educational Foundation. In addition, the winning author will be invited to present his/her work at the Chicago Quantitative Alliance (CQA) Fall Conference, to be held in Chicago, USA, September 13-14, 2017.